From SOBA and ADA compliant railings to safety curbing and accessible ramps, EZ Dock’s products can be configured to meet U.S. Access Board’s regulatory guidelines ensuring universal accessibility. In 1993, the Access Board established an advisory committee to recommend accessibility guidelines for recreation facilities. EZ Dock continually follows these guidelines and recommendations for both accessible boating facilities and accessible fishing piers. In 2010, the National Marine Manufacturers Association (NMMA) recognized EZ Dock as a leader in accessibility innovation for our EZ Launch® Accessible Transfer System. For projects outside the U.S., EZ Dock will help you design a dock system that meets local governmental or regulatory guidelines and accessibility standards. EZ Dock is a global organization with a worldwide distribution network of multilingual professionals who can help you create a marine facility that everyone can enjoy. 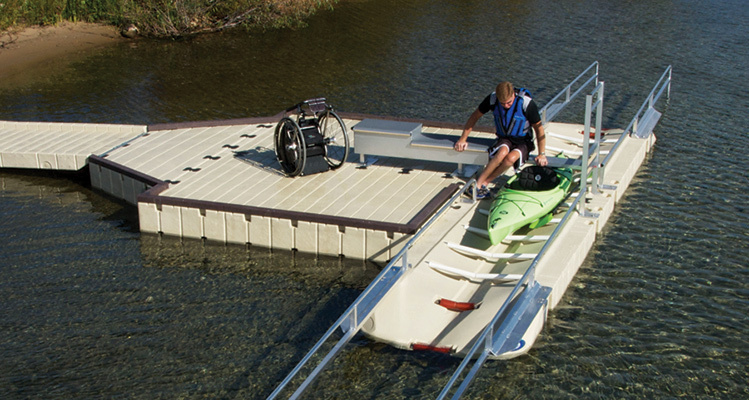 A first in the industry, the EZ Launch® Accessible Transfer System for kayaks and canoes provides individuals with disabilities accessibility that exceeds the minimum requirements of the Americans with Disabilities Act (ADA). The easy-to-use transfer bench and transfer slide boards allow users to simply sit, slide over and drop down into a kayak or canoe then use the side rails to pull off or back on. The transfer bench is built with two heights for easy transfer from wheelchairs of varying sizes, and the transfer slide boards accommodate differing watercraft heights. Browse EZ Launch® products here, or contact a local dealer for help designing your accessible dock system.